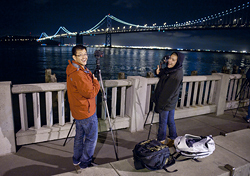 Our instructors at Aperture Academy have a particular fondness for night photography. 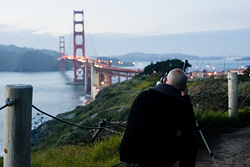 Couple that with the fact that San Francisco is one of the prettiest cities in America with its impressive skylines, iconic landmarks, Bay spanning suspension bridges and anything goes vibe, and you've got the makings for a great night of photography out on the city. 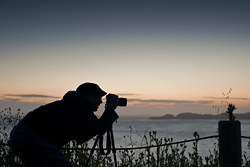 We like to begin the evening at Baker Beach as it's a perfect place to warm up our trigger fingers with grand views of the evening light on the Golden Gate, introduce many to the benefits of working in full manual mode, as well as suss out individual strengths and needs when it comes to the foundations of photography like determining proper exposure and creating stronger compositions. 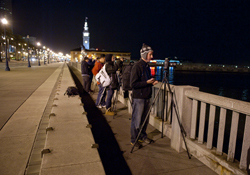 Ultimately on this evening the sun hid behind a layer of marine fog as the magic moment of sunset approached but not to worry, this is a night photography workshop and conditions were looking good. After quickly shuffling everyone's cars to a designated parking spot, everyone hopped into Brian's vehicle and the new ApCad ApCab, our newly acquired Mercedes van. This thing is sweet and the only accessory I can think of that we missed is the back seat super sized hot tub. Perhaps for 2012. Next stop, the Palace of Fine Arts. After scouting this location and shooting this spot on many different occasions and time slots in an effort to figure the optimum time for night images , our team at Aperture Academy come to the conclusion that right after sunset seems to be the best time. The lights of the palace are all illuminated, not only giving dramatic conditions for night imagery but also providing spectacular reflections of the Palace and columns in the surrounding water ponds. The early post sunset timing further accentuates the compositions in that there is still a tinge of cobalt blue in the sky. The result is some incredible conditions for classic night architecture imagery. 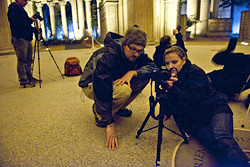 Its here that we can also dive deeper into the intricacies of taking pictures in a low light environment. Additionally, long exposures often brings out details in colors and patterns not usually seen by the human eye, which was the case at this site. There was a slight breeze on this evening, so the night reflection of the Palace seen in the lagoon at first glance seemed to be a mishmash of light patterns. However, utilizing long exposure times smoothed out the water's surface and thus revealed an almost mirror image of the Palace. Finishing up underneath the Palace dome, next stop was the super crooked sections of Lombard Street. 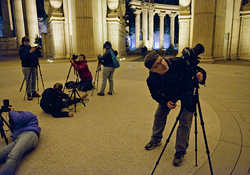 The crooky section of Lombard at night is a iconic San Francisco destination and a perfect locale for night photography. As cars slowly drive down this super steep and super twisty section, actuating their neon red brakes, our long exposures were able to record their serpentine path. There are so many different angles and vantage points along this little section of Lombard, one could come and photograph here every night for a year and get a different image every time. Conditions were perfect this evening. The skyline was clear with excellent backdrops of Coit Tower and the Bay Bridge. Everyone seemed to enjoy this spot and judging from what I saw on numerous view screens, some truly excellent images were collected. Four hours had flown by but the San Francisco chilly weather can creep up on you so we once again grouped up in the ApCab stealth van and headed off to a local deli to grab a quick snack and warm cup of Joe. 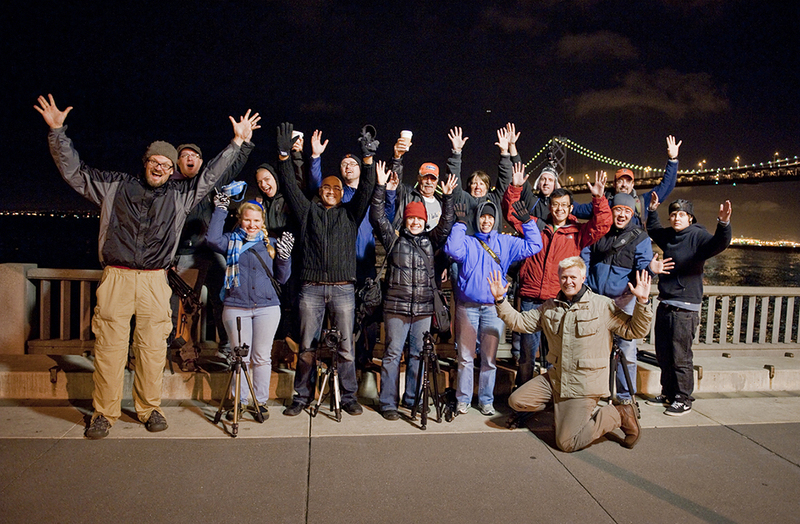 Fully refreshed and properly warmed up, we set off to the final destination of the evening, the Embarcadero. 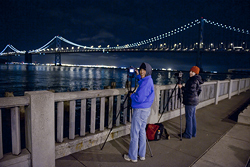 This is one of our favorite places to shoot and truly beautiful images of the Bay Bridge are here for the taking, so to speak. Additionally, there's a favored section we like to direct our students where dilapidated cement and steel rebar pier columns rise up out of the water in a slight checkered pattern. Coupled with a fully illuminated Bay Bridge as a backdrop, long exposure times, reflections off the water, the scene begins to resemble something from a science fiction urban Stonehenge. This shot is an iconic view found in many professional photographer's portfolios, and we demystify it and help every student to come away with their own version. By this time, everyone seemed to be really enjoying as well as mastering the techniques they had picked up over the course of the night. Judging histograms, determining proper exposure, adjusting white balance, the roles of aperture, ISO's and shutterspeed when creating an image had been warmly embraced by this really fun group. Once again, some show winner images were starting to pop up on the LCD view screens. Midnight was almost upon us yet despite the late hour, many in the group were so enthused by the images they were getting at the last spot that they vowed to return the following evening. With CF cards full of night images and new ideas and inspiration acquired, we headed back to our original rendezvous point where I'm sure a comfy bed was the next priority as we said our goodbyes for the evening. Until next time...Scott, Brian and the rest of the Aperture Academy team!